I loved this book! * I could not stop reading it, and couldn’t wait to see what happened next in her story. It is a cross-genre memoir that is part biography, part travel journal, with equal measures of culinary and cultural background and recipes. 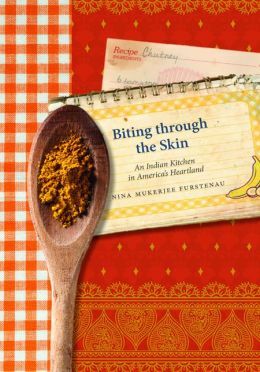 The book tells the author’s story with an emphasis on how she relates the food, cooked first by her mother and later by herself, and her Bengali Indian background into life in a small Kansas town. As a first-generation immigrant, it is interesting to see the world through her eyes, as she struggles to discover the part of herself embedded deep within her culture, though she had a tendency to hide it away from mainstream Americans for fear of being labeled “different”. I liked how she talks about the recipes her mother got from her family in Bengal when she first got married, and how these were the same recipes that the author used when she joined the Peace Corps and was living in Northern Africa with her new husband. I also enjoyed the link she made between food and language, and how much the two are linked. It made me want to do an anthropological study on the topic. Then there are the recipes, which are at the end of each chapter and explain the author’s story almost better than anything else. Can’t wait to try the Carrot Halwa, Ginger Mashed Potatoes with Savory Filling, Minced Meat Curry, and Yogurt Fish. This book reminded me of another excellent culinary memoir entitled Maman’s Homesick Pie: A Persian Heart in an American Kitchen. There were a lot of excellent quotes in it, especially the ones relating to food, such as “Food was my tether to heritage; it revealed my world and transformed me into someone willing to share that story with others,” and “Food holds memory. It holds story. It can represent who we are.” For another more-detailed review on the book, check out this blog post . For the blog of the author, which includes her wonderful writing, recipes and a list of her publications, check that site out. *I received this book as an Advanced Reader’s Copy from Netgalley. It did not affect how I viewed and reviewed the book. I apologize for not posting on Friday. I love doing the art posts, but this past Friday was just so hectic, I didn’t get a chance to do anything. I will do better this week. My hubby is gone to England to visit family and attend his sister’s wedding, so it’s just me, the baby and the pooch. I’ve been bored and lonely here at home, so I decided to experiment with some recipes this week. Usually my hubby is the cook and I look after the baby. Don’t get me wrong, I can cook, I just haven’t felt like it in ages. I’ve been wanting to bake for forever, as it is calming and therapeutic, but I’ve just not been motivated. Now I have 9 days to myself so I figured I would try some recipes. Just now I made a modified version of Mabo Dofu. It is a Chinese dish that they also make in Japan, and the Chinese call it Mapo Tofu. I used this recipe from the website http://www.justonecookbook.com. In my version, I doubled the garlic and ginger, and added another 3/4 pound of pork (trying to use the whole package that I bought). I took out the green onions entirely. The original recipe says to use 2 1/2 Tbsp Tobanjian with or without chili, but I didn’t know what it was so I decided to sub about 1 1/2 tablespoons of Chinese chili-garlic sauce instead. Turns out Tobanjan (this is the correct spelling) is bean sauce from China (more info on it here). The author of the original recipe does not specify what kind of miso to use, so I used what I had on hand, which was red with mixed grains. So I’m sure mine tastes far different than the original recipe, but it’s pretty tasty to me. I might add some more chili-garlic sauce to give it a bit more a kick. I think if I make it again, I’ll make some rice with it. I also am planning on making some lemon-raspberry bars. I had originally wanted to make them for Mother’s Day for my mom, who was unable to leave her house due to a health issue, but I was so exhausted I decided to wait a day. The recipe is here, so feel free to make it on your own. I’m sure they’ll be yummy – how can they not with fresh raspberries in them? What kinds of interesting things have you cooked/baked recently? My parents went to Greece before I was born and brought back a great little cookbook. I consider this book to be the authoritative word on Greek cooking. Its Pasticio recipe (basically Greek lasagna) is the only one I like to use because it is so good. My dad was a Classics minor in undergraduate school, so he was thrilled when they got to see all the famous sites from the Classical Age of Greece. Alas, I have never been but hope to one day. When I was in middle school, I found a recipe for Stifado, or Greek Beef Stew. It has become a family favorite, topped with feta cheese, especially in the wintertime as it is a hearty meal. I love Gyros (I know this is really Turkish, but Greeks claim it too), Greek Salad, Stuffed Grape Leaves, and pretty much all Greek pastries. Whenever there is a Greek Festival in the city we are living in, I try to go to all those as well. When I was in graduate school at University of St. Andrews, two of my best friends were Greeks. One was from Kefalonia (an island off the Ionian coast of Greece) and one was from Athens. The Kefalonian studied Social Anthropology and did her thesis on Laughter and Madness in Kefalonia, and the Athenian studied Art History and did her thesis on a Portuguese artist named (I think Maria Helena Vieira) da Silva. We also had three Greek Physicists on the floor below who frequently came up and had dinner with us. Living with them and learning about their culture and way of life was amazing. They were full of so much vitality and personality, kindness, hospitality (I know where I can stay if I ever make it there), and love. It is because of my Kefalonian “Effie Mou” (my Effie, mou being a term of endearment) that I eat zucchini because of her zucchini/courgette and feta pie, and Greek olives. She used to get these care packages with fresh cheese, olives, olive oil and grappa from back home that I just loved! I recently found this website on Greek food and culture called Kalofagas, which means “gourmet” in Greek. It has some excellent recipes for Greek, Canadian, American, Indian, Italian, and Turkish food. The website has Non-traditional desserts like ice cream and this other ice cream and this gelato, as well as more traditional Greek fare such as Kunefe and the more interesting Artichoke Moussaka (for those like me who don’t like Eggplant). This is the first time I’ve gotten a chance to sit down since I got home and take a few moments for myself, as I have just put him down for bed. I love being a mom but it wears me out. I will say that it is nice to be able to talk to other moms about what I’m going through, as I know they have experienced the same thing at one time or another. The coolest thing that happened today is something that actually started a week or so ago. I had a Young Adult author send me a message on Goodreads and say that he thought I had an honest opinion in my book reviews, and asked if I had ever reviewed self-published materials. I told him other than a few free books for the Kindle, I had not, but I would love to review his book if he wanted me to. So he mailed me a free copy and I got it today at work, so that was a pleasant thing to come into today. Here’s the link to the book on Goodreads. This soup combines two Mediterranean soup, bouillabaisse and papa al pomodoro. Makes 4 servings; Time: 40 minutes. Put the oil in a large pot or Dutch oven over medium-high heat. A minute later, add the fish fillets, raise the heat to high, and cook for 1 to 3 minutes on each side, until the fillets are opaque and seared on the outside but still nearly raw on the inside. Remove the fish from the pot and reduce the heat to medium. Add the onion, fennel, and garlic to the pan. Sprinkle with salt and pepper and cook, stirring, until everything is fragrant and the onion and fennel soften and turn golden, 5 to 10 minutes. Add the tomatoes and cook, stirring occasionally, until the pieces break up, 10 to 15 minutes. Cut the fish into bite-sized pieces and add it along with the stock and bread to the tomato mixture. Bring to a gentle boil, bubble for another minute, and take the pot off the heat. Cover and let sid until the bread is saturated with the soup, about 10 minutes. Stir in the basil if you’re using it, then taste and adjust the seasoning. Divide the soup among bowls, top with a drizzle of oil and more black pepper, and serve.